FROM THE BANK OF THE WEST CLASSIC AND THE SOUTHERN CALIFORNIA OPEN (Day 1) – It’s been about 27 hours since Dominica Cibulkova took out Aga Radwanska in a terrific three setter to win the Stanford and I am still amazed how she managed to mentally turn things around post her double bagel devastation at the hands of the Pole in Sydney. Some players have short memories when it comes to losses, and others have very long ones. The best thing that Cibulkova did was watch a replay of that first set in Australia, and in her mind she was convinced that it was close and some games could have gone either way. I wasn’t that convinced, but I was sitting on the sidelines that evening and didn’t have a racket in my hands so there is no way I can really known how close she felt to winning certain points had she swung her racket a bit differently, moved her feet into another position, or changed her game plan. But she still had to win the match and after dropping the first set due to some sloppy play, it sure didn’t look like she was going to establish the proper rhythm to pull off the upset. But she did and not only did she smack her groundies and returns with force, but she mixed up her attack very well, especially employing a deft drop shot and charge maneuver time and time again. She varied her angles off the ground and went to a 3/4 first serve so that Radwanska wouldn’t easily get in front of points. All that mattered a great deal, but somehow Radwanska got off to a 4-2 lead in the third set. She was not playing all that well – in fact later on she said she had virtually no rhythm the entire week and had plenty of problems in her game – but she did push Cibulkova very hard to close it out and actually could have won the match if the Slovakian failed to convert one of the five matches points. But Cibulkova did after a long rally and a bullet backhand crosscourt winner. A hearty 3-6 6-4 6-4 victory was hers and now, once again, the 24 year old has shown that on a great day she can play with likes of Radwanska, Victoria Azarenka, Petra Kvitova and Caroline Wozniacki. Can she stay with Serena or Maria Sharapova at a Slam? Sure she can if she maintains focus and plays the right way, which hasn’t been able to do often enough because she loses her temper, as well as her nerve and begins spraying he ball. But she feels older and wiser and will have a stern test in the first round of the Southern California Open in Carlsbad when she faces seventh seed Ana Ivanovic. She feels up to the challenge, but going deep and back to back tournaments is a challenge for any player. Once again I drove from Stanford to Carlsbad on Sunday night and Monday morning, arriving at 4:30 AM after a weaving through a sneaky Caltrans detour off the 405 in Seal Beach. This is more than likely the last time that I will have to do that drive, as it by all accounts it appears that the tournament will move out of La Costa Resort, even though Omni Resorts bought La Costa last month and is said to be pro professional tennis. The word off court is that Octagon wants to get rid of the tournament, that a group in Japan really wants it and unless some group in the US can match that bid it will leave US shores. Nonetheless, the Carlsbad draw is stronger than Stanford’s and has a lot of flavor to it: Azarenka returns from her knee and hip injuries and seems to be itching to get back on hard courts and strut her stuff once again. Here’s an interview I did with her today where she talks about raising the bar for herself, among other things. Radwanska is the second seed and will play the winner of Daniela Hantuchova and Tamira Paszek, and Kvitova is the third seed and when I spoke with her today, she still seems unsure about how she will faire on North America hard courts given her allergy troubles in humid climates, but she did have a strong US Open Series last year until Marion Bartoli stopped her at the US Open, so it’s not out of the realm of possibility that she makes another solid run. But despite her immense talent, it’s so hard to predict where she will end up. She defines puzzling. Here are a few of her thoughts on her loss to Kirsten Flipkens at Wimbledon. Some other names we didn’t see last week outside of Ivanovic are Jelena Jankovic, who out-lasted Mallory Burdette in three sets; Virginie Razzano, who took down Svetlana Kuznetsova in straight sets; Carla Suarez Navarro, Roberta Vinci and Laura Robson, whom if she bests Ayumi Morita could play Kvitova in an Aussie Open rematch. I heard Robson saying today that when she introduces herself in the US so few people hear the name Laura and call her all sorts of different names. While it could be the lack of exposure by many Americans to a British accent, it could also be that the cultured English can be hard to understand at times: when asked by the WTA LIVE host what her second favorite sport was, Robson answered darts, and Cibulkova, who was co-hosting asked, ‘Dancing? You dance well?’ They all had a good laugh and then Cibulkova said that she finds it harder to understand the Brits more than she does the Americans, which is no insult to the UK as many people there have a richer way of speaking and some Americans speak with a flat accent, or almost none at all. It should be noted that CoCo Vandeweghe qualified for a tournament for the second straight week, besting Olga Savchuk. Francesca Schiavone overcame her Fed Cup teammate Flavia Pennetta 7-6(4),6-7(8),6-4 in three hours. Pennetta lost 11 of the last 13 points. In that stretch, Schiavone only had to paste one winner. It’s going to be a long road back for Flavia from injury and it’s possible that she will never see the top 10 again in singles. She’s playing doubles this week with Sania Mirza as Bethanie Mattek-Sands won’t play doubles the rest of the summer in order to save wear and tear on her body. The “Tallest Finals Match in ATP World History” turned out to be one of the best finals so far in 2013 as John Isner and Kevin Anderson went the distance, playing three tiebreaks with Isner eeking out a 6-7 (3), 7-6 (2), 7-6 (2) win in the 2013 BB&T Atlanta Open. John Isner, at 6’10”, and Kevin Anderson, at 6’8″, combined for the tallest final in ATP World Tour history. They trace their rivalry back to their college days at the University of Georgia and the University of Illinois. What began as an indoor college match in the fall of 2005 between the Bulldogs and Cavaliers now has blossomed into a fun rivalry on the ATP World Tour. Both players were looking for their first BB&T Atlanta Open title; Isner was a two-time finalist. “Fun” is a good way to describe what took place on Sunday when these two met in the finals of the BB&T Atlanta Open, an ATP World Tour 250 at Atlantic Station. Is was no surprise when the first set ended up in a tiebreak with no service breaks and only two break points opportunities (for Anderson). The difference was in the tiebreak — when Isner’s forehand seemed to leave the stadium — Anderson capitalized, and closed out the breaker 7-3. More of the same in the second set, as there were only three break point chances, two for Anderson and one for Isner. Both players served up nine aces in set two and had a first serve percentage of 63 percent. Even stats like those usually mean another tiebreak and that is just what Atlanta tennis fans got. This time it was the was Isner who put pressure on his opponent to force two straight Anderson errors at 2-2 in the breaker. 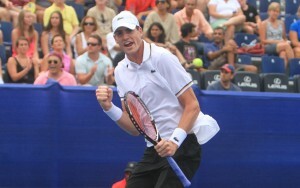 With a partisan Atlanta crowd and numerous University of Georgia alumni in attendance, Isner caught a second wind to close out the tiebreaker 7-2. Anderson began the deciding tiebreak with an unforced error to fall behind 0-1. Isner then took his two service points before Anderson got on the board. Training 1-3, Anderson committed yet another unforced error while Isner turned up the volume on his serve and getting another backhand unforced error gift from Isner to take the breaker 7-2 and delighting his Atlanta fans. In total, Isner saved 11 break points and that was the key to the match. “I never wavered, I believed at love- 40 or whatever, it was that I could hold on,” explained Isner. 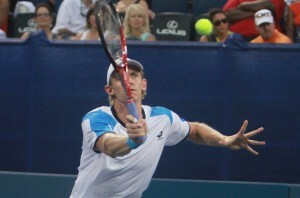 Anderson said he didn’t lose focus when he failed to convert on numerous break point opportunities. With the win, Isner pockets $98,700, 250 ATP World Tour ranking points and 70 Emirates Airline U.S. Open Series points to take the lead in the US Open lead up competition. In the doubles final, Edouard Roger-Vasselin and Igor Sijsling defeated Colin Fleming and Jonathan Marray 7-6(6), 6-3. The 2:54 match turns out to be the longest best-of-three sets final on the ATP World Tour in 2013. This was the first ATP World Tour final with three tie-breaks and no breaks of serve since the 2012 Chennai final between Milos Raonic and Janko Tipsarevic. Of Isner’s seven career ATP World Tour titles, three have come after saving a match point. Isner is 8-0 in decisive set tiebreak matches in 2012-13. 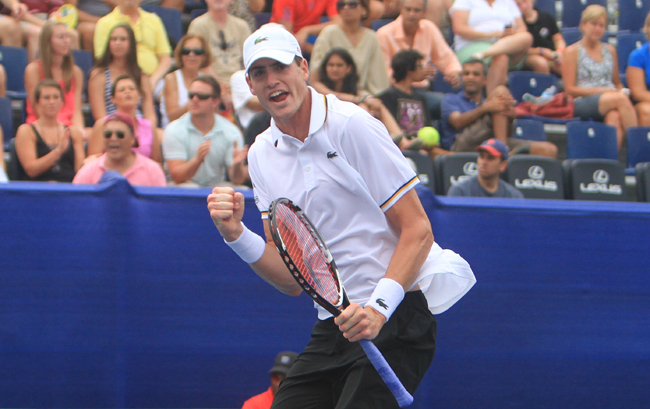 Isner’s seven career ATP World Tour singles titles equals the number held by his occasional doubles partner and good friend Sam Querrey. He also passes Mardy Fish who owns six titles. Another double bagel for Radwanska over Cibulkova in BOW final? FROM THE BANK OF THE WEST CLASSIC AT STANFORD, DAY 6 – Partly due to necessity, players sometimes rewrite their own personal histories in order to be able to move ahead with their careers after devastating defeats. After she bested Sorana Cirstea 6-4 6-0 in the semifinals of Stanford and discussed a possible meeting in the final with Agnieszka Radwanska, Dominika Cibulkova reflected back on the 2013 Sydney final, when the Pole blistered her 6‑0, 6‑0 to win the title. “Lots of things are going to have to change for Dominica Cibulkova in the next few days after Aga Radwanska blistered her 6‑0, 6‑0 to win the [Sydney] title. The Slovakian was ridiculously erratic early and then she became scared and then she couldn’t keep a ball in the court of any kind. You could tell that the super steady Radwanska – who seemed to read where she was going all night long – felt a little bad for her, but as Radwanska said later, this is tennis and in tennis things happen and you never ever take your foot off the pedal, even when you can sense your foe’s meltdown and all you have to is get the ball back in the court. “When I lost that 1‑0 again in the second set, I just completely kind of break down and stop thinking about what I have to do and how to play well. I was just thinking, Oh, my God, what is happening? I was not choking, but I was starting to think about the score,. Until then I had some strategy that I want to do. And then after 6‑0, 1‑0, 2‑0, I was like, Oh, my God, what is happening? Now it’s like the score that didn’t want to be in. After I stopped thinking and I was just thinking about the score all the time. After I just wanted to stay in a rally with her, but it’s just not something I’m used to d. I’m just start to play with less power, and that’s not where I feel comfortable. Then I just didn’t want to do the mistakes and then I was doing even more mistakes. It was just like this, going round [in a spiral]. I knew that she would not give my one easy ball, and it was making my frustration even bigger. How often does a world No. 15 lose to a world No. 4 6-0, 6-0 in a final. Hardly ever. How often does the notable player who was double bageled, come back at a Slam a few days later and go on a major run? Has it ever happened? While Cibulkova chances of reaching the second week of Melbourne may have totally disappeared, Radwanska, who went off into the Sydney night in search of big piece of cheesecake, is feeling very good about herself. win over Jamie Hampton in the semis, the Pole is looking confident again, so she will enter the final a substantial favorite and should she win the title, perhaps she will be able to forget her emotionally devastating loss to Sabine Lisicki in the Wimbledon semis, a Grand Slam she admits was on her racket. History will be made in Atlanta on Sunday as the tallest ATP Tour final in history will take place when 6’9″ John Isner meets a familiar foe in 6’8″ Kevin Anderson. Expect big serves, huge forehands and maybe a tiebreaker or two by these two players who first met in the fall of 2005 as college players at the University of Georgia (Isner) and the University of Illinois (Anderson). In Saturday’s first semifinal, two players that know each well, and played each other in a semifinal match just two weeks ago at Newport, in tournament top seed John Isner and Lleyton Hewitt took to the court under overcast skies in Atlanta at the 2013 BB&T Atlanta Open. Hewitt led the career head-to-head with Isner 4-1 coming into the match, with that including a win in that Newport encounter. Isner is a two-time finalist at the BB&T Atlanta and always appears confident and enjoys tremendous support when he plays in Atlanta. The previous two meetings between these two both went three sets and this one was no exception as Isner squeaked out a 6-4, 4-6, 7-6 (5) win and a trip to Sunday’s final. There was nary a service break to be found until the 10th and final game of the opening set when Isner played perhaps his best service game of the entire tournament to break and secure the set. Isner tallied 10 aces in the first set, served 68% and didn’t face a break point. The second set looked like more of the same until Hewitt amped up his weaponry and put more returns in play forcing the American to make three straight unforced errors in the fifth game. Isner then broke back to 3-3 before he played more loose points and fell down the break that would ultimately decide the set. The third set was all about living dangerously as Hewitt faced a break point early on and then Isner fell behind love-40 in the seventh game of the set and faced another break point in the ninth game- saving them all. As with many Isner matches, this came down to a tiebreaker and with Isner carrying a 23-6 record in tiebreakers into this decider, Isner said he was feeling confident. Isner was also happy with the way he hit his forehand. Hewitt, who has not played in an ATP World Tour since Las Vegas in 2007, will now move into the top-60 in the ATP World Tour rankings on Monday morning. Isner will be seeking his seventh ATP title on Sunday. An intriguing semifinal between Ryan Harrison and Kevin Anderson was on next. 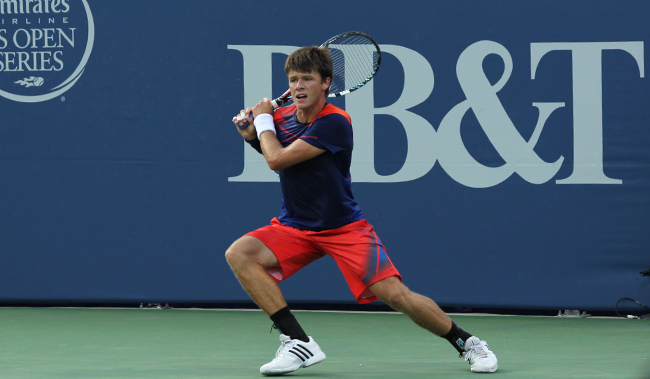 Harrison was looking to continue what has been a great week for the Harrison family in Atlanta and Anderson was looking not only for a title, but a move into the top-20 of the ATP World Tour rankings. Anderson has been one of the most consistent players on tour this year and that showed in the first set as he waited patiently for his opportunity to break in the eighth game and then closed out the set with his fifth ace of the match. A well played second set included zero service breaks, so that meant a tiebreaker. Anderson took control at 3-2 in the breaker with a passing shot and an overhead smash that gave him mini breaks and then the match 6-3, 7-6 (3). Isner leads the head-to-head with Anderson 5-3, and has taken the last two meetings, but every match but one has featured at least one tiebreaker and last year in Shanghai they played three breakers. Anderson said that will be in the back of his mind, but he’s mainly focused on what he needs to do. “I think for tomorrow, it’s important for me to take care of my service games and be patient,” offered up Anderson. Anderson has taken notice that his, and Isner’s careers have paralleled and criss-crossed each others since their college days, and he’s noticed what John has accomplished. “I feel since we turned pro at the same time and had been ranked similarly, the top-10 is a place where I can be,” said Anderson. In doubles semifinal action, the pair of Edouard Roger-Vasselin and Igor Sijsling defeated the Israeli team of Jonathan Erlich and Andy Ram 3-6, 6-1, 10-7 while the British duo of Colin Fleming and Jonathan Marray took down Chris Guccione and Lleyton Hewitt 6-4, 7-6 (6). ESPN2 will cover the men’s singles final live at 3 p.m. Eastern time. Lleyton Hewitt’s summer rise up the rankings continued on Friday as he rebounded from losing a 17-minute first set to Ivan Dodig of Croatia and advanced to the semifinals of the BB&T Atlanta Open, a ATP World Tour 250 event. The 1-6, 6-3, 6-0 win, means another showdown with John Isner on Saturday. The pair met two weeks ago in the Newport semis with Hewitt winning. After dropping the first set, the two-time major champion converted on four of five break-point opportunities to win going away. Another key to the victory for the Australian, Hewitt improved his 43 percent first serve percentage from his previous matches to 57% for the Dodig match. In the second afternoon semifinal, top seed Isner defeated fellow American James Blake 7-6 (1), 7-6 (5) in 1 hour and 27 minutes, setting up a rematch with Hewitt and a match that many in Atlanta wanted to see once the draw came out. “Coming to this tournament, it’s my fourth year, I always seem to have incredible support,” offered up Isner, the world No. 22. “I do have some roots in this vicinity with going to school so close here, and given how many Bulldog alumni live in Atlanta. The first set featured both players holding serve throughout and not one break point. Nobody on the ATP World Tour has played more tiebreaks than Isner and he showed why his is so comfortable in breakers by being dominant on serve and then taking chances on the serve return. When he connects on serve returns in a tiebreak –where every point matters — Isner is just about unbeatable. Blake jumped out to a quick break in the second set and looked in command until he played a sloppy service game at 4-2. As with any Isner match, it always comes down to a crucial point or two, and a tiebreak. Isner with a 1-4 career mark against Hewitt said he’s looking forward to playing Hewitt, but he needs to serve well. Although his younger brother, Christian, has received most of the attention this week, Ryan Harrison was looking to garner some of his own as he took on Santiago Giraldo of Colombia in the first quarterfinal of the evening session. Playing inspired tennis, Harrison scored the only break of the opening set and with that break in hand, the American leaned on his serve to close out a 6-3 first set. The Colombian raised his level of play to start the second and Harrison threw in a sloppy service game early in the set to fall behind. Harrison wouldn’t see a breakpoint in set two and one ball felt the wrath of the Louisiana native and landed out on the I75/I85 downtown connector in Atlanta, while Giraldo closed out the set 6-3. Giraldo again jumped out on top in the deciding set, and Harrison squandered break points in games three and five. A tiring Giraldo ended up giving back the break mid-set and with no further breaks, Harrison was dominant in the tiebreak, taking it 7-2, and the match 6-3, 3-6, 7-6(2). All in all, Harrison was pleased with the effort and is happy to be making another final four appearance in Atlanta. Next up for Harrison, a matchup with tournament No. 2 seed Kevin Anderson. Anderson won a tight three-setter against Denis Istomin on Saturday night 6-3, 3-6, 6-3. Even though Harrsion gives away six years, eight inches, and over 100 ranking spots to the South African, they both turned pro in 2007, and are both playing some of their best tennis of the year in Atlanta. Amazingly enough, these two have never met in an ATP, Challenger, Futures or qualifying tournament. The 4 p.m. match on Saturday featuring Hewitt and Isner will air on ESPN2 and the Anderson vs. Harrison semi will run at 8 p.m. on Tennis Channel. FROM THE BANK OF THE WEST CLASSIC AT STANFORD – Dominica Cibulkova will likely face this question every year for the rest of her career: why have two women whom she faced off against in the juniors, Victoria Azarenka, and Caroline Wozniacki, been able to reach No.1, and she hasn’t? The Slovak was born in 1989, the same year that Azarenka, Agnieszka Radwanska, Sabine Lisicki and Yanina Wickmayer were. Right behind them 1990 babies Wozniacki and Sorana Cirstea, whom she also saw plenty of in the juniors and will play in Bank of the West semis. Given how hard she hits the ball, it would be ridiculous to say that because Cibulkova is short that she is always facing an uphill battle power- wise. She can crack groundies with anyone and is pretty fast. Clearly, at 5-foot-3, her serve will never be a big weapon, but her first serve is very decent. Radwanska faces the same challenge and her overall results have been better than Cibulkova’s. Even Lisicki just reached a Slam final. So perhaps “Domi’s” lack of a big title is in her head. Cibulkova pulled off a fine 7-5, 6-3 win over Urszula Radwanska in the quarters, who pulled muscle in her right ankle in the third game of the second set. The younger Radwanska is a tougher out than she used to be, and is more than just a counterpuncher, but she prefers longer points while Cibulkova likes to slug it out – for the most part. She can play more patiently at times and with the help of her coach Matej Liptak, made a strategic shift to go down the line more rather than constantly going crosscourt. Cibulkova, who understands Polish, heard Radwanska complaining about the court (“it’s to fast,” it’s too fast”) and knew she had a mental edge. She can hit flat and through the court. But in order to close out the match, she had to mix it up. However, she does not think she’s peaked intellectually as a player. “I wouldn’t say a much smarter player,” she said. Cibulkova needs to be though if she going to realize her top-10 dreams. She has had an up and down season, mostly due to injury, but she has cracked the top 15 before and is chock full of ambition. She is still often caught in between being a first strike demon and being more of a conservative player. Working the points more would benefit her, but when she gets on a roll she can’t resist going for the corners. Sometimes, like for abut half of her win over Radwanska, her balls kiss them. Cibulkova does admit that she still does compare herself to her peer group from the juniors, but not in negative way where she gets depressed because she hasn’t had their success, but in a more a positive way where she treats them just like she did when they traded strokes as kids—as equals. She will surely do the same when she plays another slugger in Cirstea on Saturday afternoon. “Of course that why when I am going to play against Caroline or Azarenka and they were No. 1, I’m not playing against No.1, but someone I’ve known since juniors,” she said. FROM THE BANK OF THE WEST CLASSIC AT STANFORD – Nicole Gibbs’ introduction to WTA play as a full-time pro went fairly well. She won her first round match over Kiki Bertens in impressive fashion and then stuck in there for a long stretch against world No. 29 Jamie Hampton in a 7-5 6-7(5) 6-3 loss. Gibbs has improved good deal over last year as she isn’t just a quick, scrappy player and can now do some serious damage with her forehand. She’s not tall, but appears to have a good court sense, which she will need in the years ahead, because she isn’t gong to be overpowering a lot of players. But being a two-time NCAA singles champion shows that she has a winner’s mentality and it would be surprising if the Santa Monica native doesn’t establish herself as at least a tough out on tour and end up having a profitable career. She has a similar game to that of teenager Lauren Davis, another vertically challenged player with a lot of heart and under stated power. Hampton hits a pretty big ball and for the most part Gibbs went right back at her, but the favored player of the Stanford football team (five men of the gridiron came to cheer her on, including quarterback Kevin Hogan) did play a little too passively at times. Moreover, Hampton didn’t play very well at all, although she competed hard, which has been her trademark this season. Now Gibbs will head down to Carlsbad to try and qualify for the Southern California Open, and really, that’s where her real test will begin because it’s much easier to play well on a court where you have had so much success and in front of adoring fans than it is on some side court in front of a handful of people trying to qualify. But “Gibbsy” — as she’s nicknamed — can take hope from her former teammate Mallory Burdette WTA success, who in just a year’s time has already cracked the top 80. Gibbs doesn’t hit as hard as Burdette does, but she is faster and during their college years together was a bit more of an accomplished player, largely do to her deep reserve of self-belief. Even though it’s been rare for the collegiate ranks to produce super elite pros over the past 25 years, college has produced some solid ones and Gibbs has the look and sound of a player who will do her university proud in the pros. Instead of what should have been a very fun and intriguing face off against her friend Madison Keys, Hampton will play Russian veteran Vera Dushevina, who took out the 18-year-old 7-6 (0), 6-2. As I wrote earlier this week, even though Keys’ massive potential is very clear, she is still very much a young teenager who has to learn how to get her negative emotions in check. She’s a better player than Dushevina is, but she’s prone to losing her cool and then becoming extremely erratic. She is also super hard on herself and was said to have had tears in her eyes after her loss, which is not the first time that has occurred this year. Recall that was still crying pretty hard two hours after her tight loss to Monica Puig at Roland Garros. She is wept after losing to Li Na in Sydney. Some players cry, others don’t, but continuing to be super frustrated by a bad night at the office is not going to help Keys learn to grit out wins. Hampton knows that better than anyone, as she can be stress monster too, which—according to her — has been one of the reasons why her back injury has flared up during some critical matches. But she has got that largely under control this season, which is why she’s cracked the top 30. Clearly, she has a shot at a top 16 seed at the US Open with some solid play over the next month. She, Keys and Sloane Stephens all have a chance to be the unofficial Young US Female Player of the Year in 2013. It will be super interesting to see who ends the season with a big smile on her face, and with her tears ducts fully closed. The other three quarters, in order of Friday play, will feature Sorana Cirstea vs. Olga Govortsova, Dominika Cibulkova against Urszula Radwanska (who scored a gutsy two tiebreak win over Daniela Hantuchova), and then starting at 8 PM PST, Agnieszka Radwanska will go up against Varvara Lepchenko. The US isn’t done yet in Palo Alto, but then again, neither is Poland. John Isner needs no introduction to the tennis fans of Atlanta. Not only is he a two-time finalist at the BB&T Atlanta Open, a former college star at the University of Georgia and the top seed this week in Atlanta, he’s been the star attraction at numerous clinics this week in Atlanta including the Emirates Airline “Emirates Returns” Kid’s Day Clinic held on Wednesday at Atlantic Station’s Central Park. When Isner took the court on Thursday night, many thought Isner would cruise past 19-year old Christian Harrison with ease. They were wrong, as Isner always seems to give the Atlanta crowds their money’s worth. Isner needed 2 hours and 24 minutes and 29 aces to take out Harrison who was playing in his first ATP World Tour main draw 7-6 (9), 4-6, 7-5 in front of an almost full stadium. In Isner’s Wednesday pre-tournament press conference, he commented that sometimes the first match he plays in a tournament is the toughest. The former University of Georgia All-American and Harrison appeared to be on course for a third set tiebreaker until Isner eeked out a break in the 11th game of the third set by putting his service returns in play. Another American moving through the draw and Christian’s brother, Ryan Harrison posted an upset win over Igor Sijsling of The Netherlands 6-4, 6-3. Ryan Harrison is not longer being be Tres Davis and is working with the USTA’s Jay Berger. It’s been a rough season for Ryan as he has sen his ranking fall to No. 132 but if he can grab another win or two here he might begin to turn his year around. For the Harrison’s, it’s been a great family week. Also posting wins a on Thursday was American James Blake who is hoping to keep turning back the clock. Blake disposed a tough Russian in Evgeny Donskoy. “I always feel like the hard court summer is a chance to play my best tennis, and when it’s hot I play pretty well,” explained Blake, who will next face his good friend Isner. Other players advancing to quarterfinal play with Thursday wins include Denis Istomin of Uzbekistan, Santiago Giraldo of Colombia and tournament second seed Kevin Anderson of South Africa. Friday, Saturday, and Sunday play will air on ESPN2 and Tennis Channel. Lepchenko’s year got off to an ominous start when her father collapsed in Brisbane. 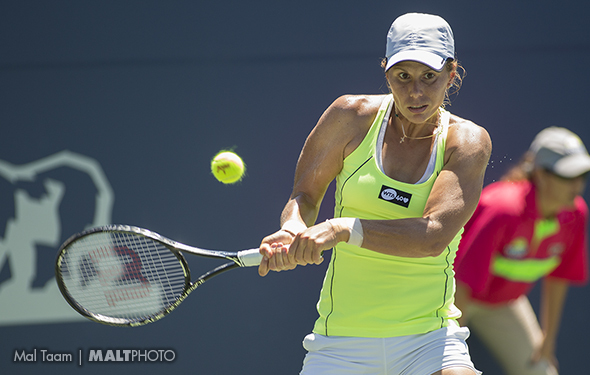 FROM THE BANK OF THE WEST CLASSIC AT STANFORD, DAY 2 – 2013 started off the wrong way for Varvara Lepchenko and it hasn’t gotten much better since, although she is hopeful she has turned the corner. How emotionally trying was her start to the year? Consider this: just before her first round match at the season’s first event in Brisbane, she was walking out to transport with her father and sometimes coach Peter. He told her wasn’t feeling very well and all of the sudden he collapsed to the ground, and had to be rushed to the hospital where doctors discovered he had a multiple ulcers which were sapping his blood supply to the tune of 60 percent of his total. A strong and driven man who Varvara says tends to stress out too much, Peter did recover, but she was out of sorts to the point where her focus was nowhere to be found in her 6-2 6-1 loss to Serena in a match she was looking forward to. Usually, like many players, she finds the court to be a refuge where she can put her off court problems behind her. But not on that day as reality slammed her harder than a Williams’ bullet forehand into the chest. Lepchenko had come into 2013 with a career high year-end ranking of No. 21, She had the best season of her life in 2012, where she reached the fourth round of Roland Garros, the semis of Seoul and the quarterfinals three times including when she qualified for Madrid. But she wasn’t thrilled with her movement coming into 2013 and couple that with having to switch roles from being cared for to caretaker for her dad during the month of January and her Australian season went down the drain. But then cast into a major role in a Fed Cup tie against Italy away on clay, she responded brilliantly in singles. Captain Mary Joe Fernandez knew that the lefthander was perhaps the only player outside of Serena Williams and Sloane Stephens (both of whom were absent) who could take down the might Italians on red dirt and she rose to challenge, battling past Roberta Vinci on day one and then smoking 2012 Roland Garros finalist Sara Errani on day 2. A native of Uzbekistan who didn’t become a US citizen until the fall of 2011, Lepchenko has been dying to picked for Fed Cup. She loved being one of the team leaders and the go-to player, but she had caught a virus that weekend and after her match against Errani she was spent. However, Fernandez had to pick her for doubles to partner with Liezel Huber because rookie Jaime Hampton was way off her game and last minute substitute Melanie Oudin was having back issues. Lepchenko says that she wished she didn’t have to play the doubles, but understood why Fernandez took the risk of going with her because she has actually become a very competent doubles player and was on a roll. She was the captain’s only realistic option, but she was too tired to have a positive effect on the match and Errani and Vinci stopped she and Huber in what would have been an incredible upset abroad. “I had nothing left,” Lepchenko said. The she experienced about the same thing that Slovakia’s Dominica Cibulkova did during the next few weeks. Another top-25 player, Cibulkova had given it all in her nation’s 3-2 win over Serbia in Fed Cup, collapsing with body cramps on day two in marathon match. Like Cibulkova, Lepchenko still felt obligated to try and play Doha, which a Premier 5 level event that players who sign up for it must at least attend and if they don’t try and compete the face ranking (and possibly financial) penalties. So even though she had a fever, Lepchenko tried to complete her match against Klara Zakopalova, but couldn’t and finally retired down 7-6 (8) 3-0. “That was terrible. I felt so awful,” she said of her physical state. One of the reasons why there are still so many players dealing with multiple injuries – some small and some significant – is because they don’t stop and take time off to heal. The tennis calendar is a gerbil wheel and unless you are already an accomplished player who has won majors and has a lot of money in the bank courtesy of massive off court earnings (i.e. Serena and Maria Sharapova), it’s not easy to skip big events even if your body is telling your to do so. Lepchenko was new to the top 25 and had elite player goals, so instead of skipping one or two of Doha, Dubai, Indian Wells and Miami; she played every single one and compiled a 1-3 record. Admittedly, that was not a smart thing to do. Armed with a dangerous left-handed forehand, slice serve and a pretty good two handed backhand, Lepchenko did have some reasonable expectations on the clay and while she didn’t play badly, unlike in 2012 when she was finding ways to gut out three setters, this time she lost a series of crucial ones to Venus Williams (Charleston), Svetlana Kuznetsova (Estoril), Kaia Kanepi (Brussels) and to Angelique Kerber in the third round of Roland Garros. There she had her chances, but she had suffered a foot injury in her second round win and wasn’t quick enough. She went down 6-4 in the final set. Once again, she stubbornly didn’t rest long enough and lost both of her matches on grass. However, her first round defeat at Wimbledon did give her time to go home and heal, but she often drives herself too hard and her father had to tell her to take a day off before her 6-2 6-4 win over Michelle Larcher de Brito at Stanford on Monday. “I need someone to tell me to stop,” she said, and then laughed and mentioned that her father was out on the courts practicing his own serve because he was unable to get it right. “He’s obsessed but he loves the game,” the 27 year old said. Right around Wimbledon, she decided to change her coaching situation. She had been working with the USTA for the past three years to great success, but felt she needed more one-on-one attention. Her father is back in the mix and she’s trying out Roger Smith as an addtrional coach, who most recently oversaw Donald Young’s career and before that, Sloane Stephens’. Lepchenko is currently ranked No. 40 and of course would like to be seeded at he US Open. She had to defend 402 points through New Haven, which isn’t a huge amount, but substantial enough to where she is going to have to have at least two pretty good results if she going to crack the top 32 by the time the US Open starts. She’s playing Stanford, Carlsbad, Toronto and Cincinnati, but won’t play New Haven. If she focuses of process rather than results – just like she did last year – she could end up in a very good place again. That is her plan. While the talented yet streaky Olga Govortsova’s 6-2 6-4 win over Samantha Stosur wasn’t a stunner given that the Aussie has had a sub par year, Urszula Radwanska’s 6-1 6-3 win over Christina McHale was a bit of stunner score-wise. McHale continues to struggle with her confidence and is playing way below her level. Coco Vandeweghe, who reached last year’s final is loving the quick courts again and thumped Monica Niculescu 6-0 6-3. Veteran Daniela Hantuchova seems to be back on track again and she out-thought Yanina Wickmayer 6-2 4-6 6-0. The Slovak then went out and practiced right after the match. Why? “That’s me,” she said. “Why make it easy when I can make it complicated?” Here is Hantuchova talking about her upcoming doubles partnership with Martina Hingis.